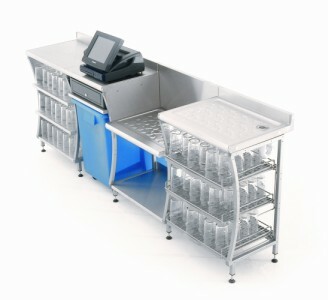 Whether your requirement for a bar is large or small KCM can design and manufacture a stylish bar perfectly suited to your design and practical requirements. Bars of either a traditional or modern style can be fabricated to compliment the aesthetics of your scheme. 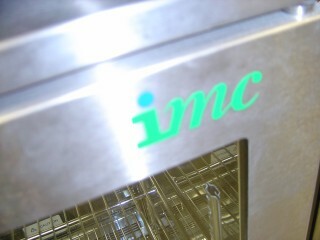 As authorised distributors for IMC we are also able to offer stainless steel underbar systems. Both IMC's 'Bartender' and 'F2' ranges offer long lasting, hygienic and stylish solutions to bar design, with a huge range of modular units. 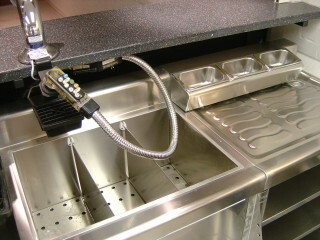 In addition we can offer an endless design of bespoke fronts and bar tops to create your desired effect. New bar in function room consisting of fabricated bar front & skirt, Corian bar top, bulkhead with security roller shutter and recessed spot lighting, with IMC 'F2' stainless steel underbar equipment. 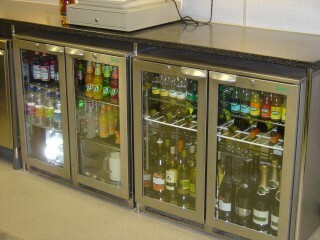 Fabricated back bar with upright and underbar refrigeration, glass storage and red wine racks.